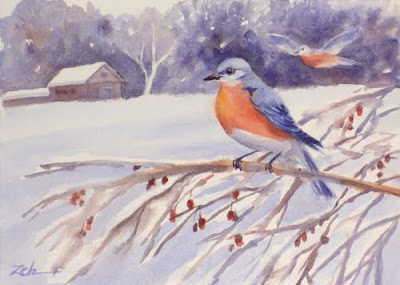 On a recent walk, I passed a nearby farm and saw a flock of bluebirds sitting on a wild berry bush. I was surprised to see them at this time of year as usually we are too far north for them to stay the winter. But, maybe I shouldn't have been too surprised. Their cousins, the American Robins, have been flocking to my crabapple tree all winter. That's very unusual too. Either the winters are milder, no matter how cold I feel, or there is more food available in the form of berries and fruit. I think it's probably a bit of both. Here are two of them. I'm always happy to see bluebirds, no matter what time of year. Too bad you don't have bluebirds. They are a sight to see! I thought perhaps you might have the western variety of bluebirds. I saw flocks of those in the hills outside Albuquerque. The same bright blue but without the red breast.